Located in the Prestigious Wooded Area of Point Loma. Surrounded by private estate style properties. 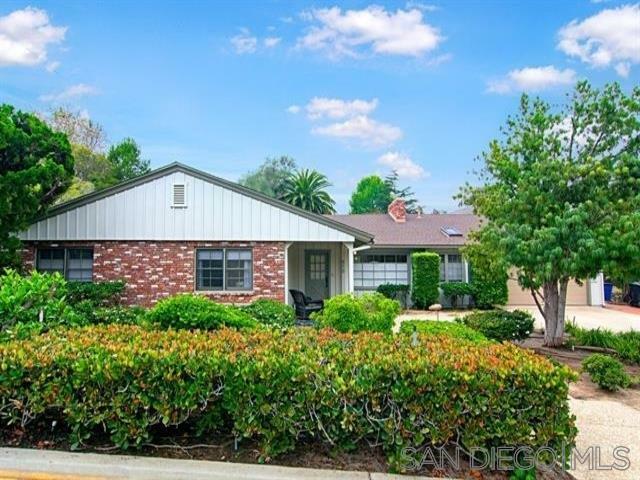 This rare, almost 3,000 sf sprawling single story Ranch Style home is filled with natural light. The spacious Living Room has an elegant adjoining Music Room. The large Kitchen, with butcher block island is ideal for the chef in your home. Kitchen and Family room open to a very private Pool and Patio settings. You won't want to miss this one! *See Supplemental Remarks for more exciting features and info., Continued: The Kitchen opens to a Study nook and grand family room, creating great function and flow. Kitchen and Family Room open to pool and patio providing exceptional indoor outdoor living & entertaining in a very private setting. Additional feature is the large Mud Room leading to the direct access 2 car garage. In the Opposing wing is a Spacious Master Bedroom with separate his and hers baths. Next to the master is a Flexible Study or #2 Bedroom with french doors opening to side patio. Down the hall you will find another Full Bath separating 2 more sizable Bedrooms #3 & #4. The spacious hall provides exceptional storage and linen areas. A large driveway is accented with additional side parking area, large enough for boat or RV. This lovely home is quipped with a Soft Water System and to top it off you will enjoy the savings provided you by the Solar Electric System. Call for your private showing today! All measurements are from public records or estimates, room sizes are approximate not exact. Buyer and Buyers agent to verify all information!